This fantastically unique color palette includes a Punch Perfetto Pocket Invitation with Mars accents. The Design Your Own Paper in our Retro pattern, printed in Mars ink on Soft Coral cardstock really ties everything together! Just a question: I know the total folded card is 6.5″ x 6.5″, but what are the dimensions of each individual section? Specifically, how wide is the pocket section, shown here on the right hand side of the card? We loved the samples, by the way! Hi Katie! The Perfetto folded size is actually 6 1/8″ square, so the middle panel is 6 1/8″, and the right panel is about 5 1/4 wide. Hope this Helps! Glad you loved the samples! Do you mind sharing the cost per invitation? Thanks for the message! The general un-assembled price, including all the details, mats, monogram, band, Envelope Liner, all the pieces you see included in the photo should come to roughly 5-7 dollars depending on how much formatting you need. 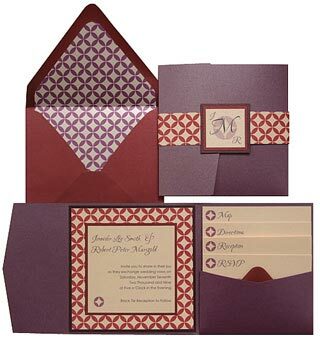 If you email the print department at printing@cardsandpockets.com, referencing the Retro Cranberry/Black Raspberry invitation from the Blog, and include any changes you would need to make including the total number of enclosures, etc., they can give you an accurate price quote depending on your individual needs. AKAIK you’ve got the asnwre in one! My colors for my wedding are Antigue gold, Ivory and Champange. I love these inviations. Is there anyway for you to change the colors to my wedding colors and give me a price on how much each invite would cost? You’ve hit the ball out the park! Incredblie!